Wedding season is about to kick into high gear. And if you have showers, socials, stag and doe parties and weddings to attend this year, you're probably on the hunt for a gift or two. While it's customary to give cash at weddings, I always like to gift something a little more personal, too, especially if the couple is close family members or friends. And one of my favourite ways to do that is definitely cute his and hers gifts (or his and his gifts / hers and hers gifts)! 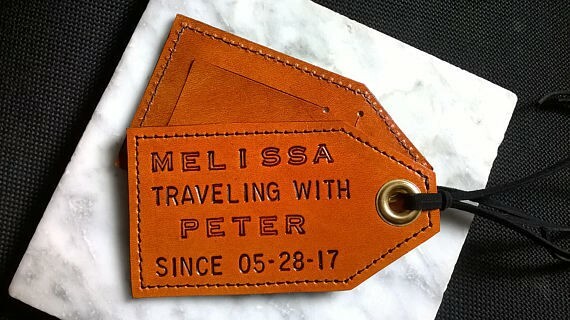 Luggage tags are especially perfect for couples who love to travel or ones heading off on honeymoons soon – and unlike knick knacks, you know they'll definitely get some use out of them! My favourites are these customizable leather Personalized Luggage Tags from Leather Made Nice on etsy.ca. They sell for $58.50 a set, and you can personalize them with names and dates, as well as which colours and fixtures you'd like. They're made in Canada and only cost $2.86 to ship, too! The couple that cooks together stays together, right? 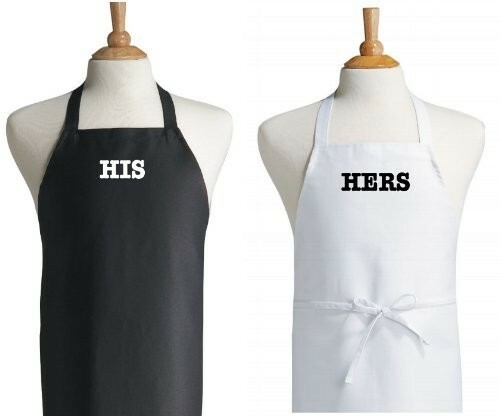 I love the minimal design of these His and Hers Aprons, especially since they're not over-the-top and too cutesy – and they're only $32.95 for the set. They're definitely something I could see a lot of my friends actually wearing! There are also similar Mr. and Mrs. Aprons, which might be perfect if you're shopping specifically for a wedding and not an anniversary or "just because" gift. Shipping is a little pricey (at an extra $12.60 per order), so we'll keep looking around for more affordable alternatives! Yes, mugs are a little stereotypical, but these are pretty sweet! After all, it doesn't matter how much you love someone – they better keep their hands off your coffee! 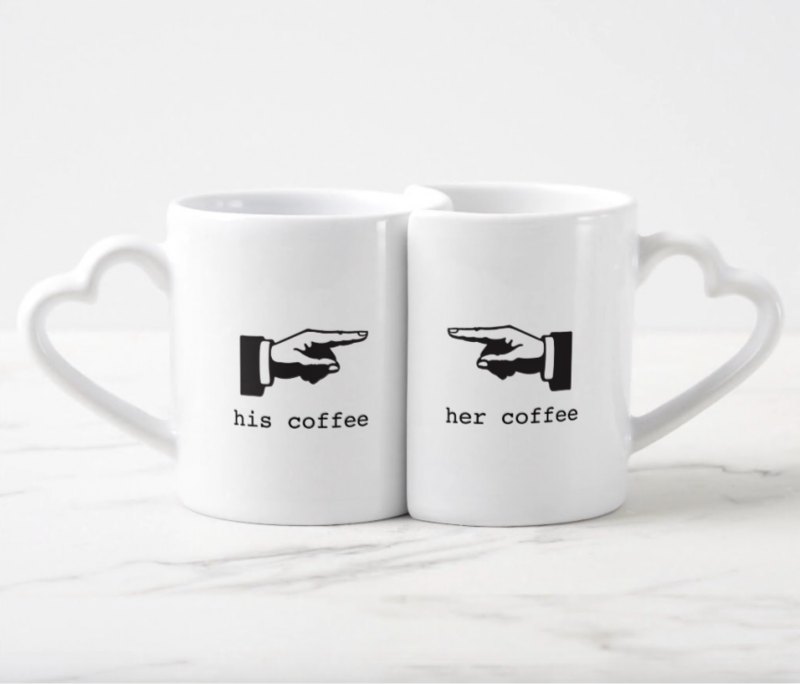 These Nesting Mugs ($27.05 for the set) from Zazzle.ca might be hugging, but they'll also help keep those morning cups separate. How fun are these?! His and Hers pillows have been around for years, but these ones are extra special! 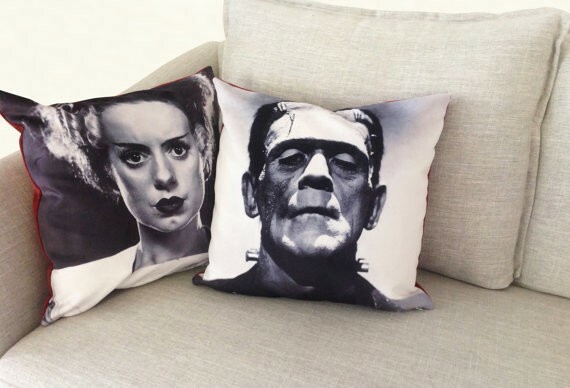 The Monster and the Bride of Frankenstein Pillows are perfect for the couple who was clearly made for each other (get it? ), and they're available on etsy.ca for just $57 a set! A few reviewers have even said these pillows look better in person than in the photos, so you're know you're getting something high-quality that's perfect for the dorky couple in your life. Shipping to Canada is (unfortunately) an extra $15. They'll need to write them somewhere, so why not get a keepsake out of it! 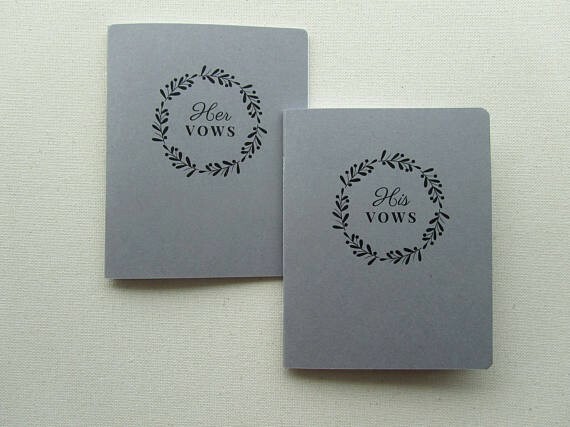 Almost every couple ends up writing vows or speeches, and these sweet Wedding Vow Notebooks ($15.62 a set) are perfect shower gifts! There's plenty of pages in each one (24 to be exact, so it's okay if they need a few drafts to get it right), and as an added bonus, shipping is FREE within Canada!